Who ate the sunflower seeds??? First week of spring! Cold and snowy! 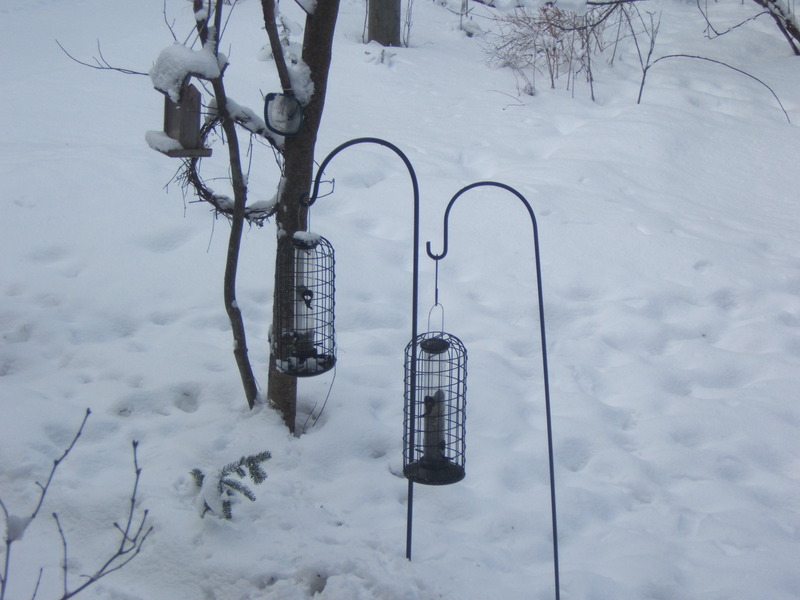 I woke this morning to find my newly-filled sunflower seed feeders all empty. Three pine siskins and a goldfinch were clinging to the finch seed feeder but the other birds are out of seed. A look at the yard will tell you who was slurping up the sunflower seeds in the night! This year, I moved our feeders to our front yard. They are not so easy to see from the house, although I have a good view from the window of our library. The deer have liked the new feeding station. We see them almost every day. They empty the feeder too quickly and also visit the compost pile. 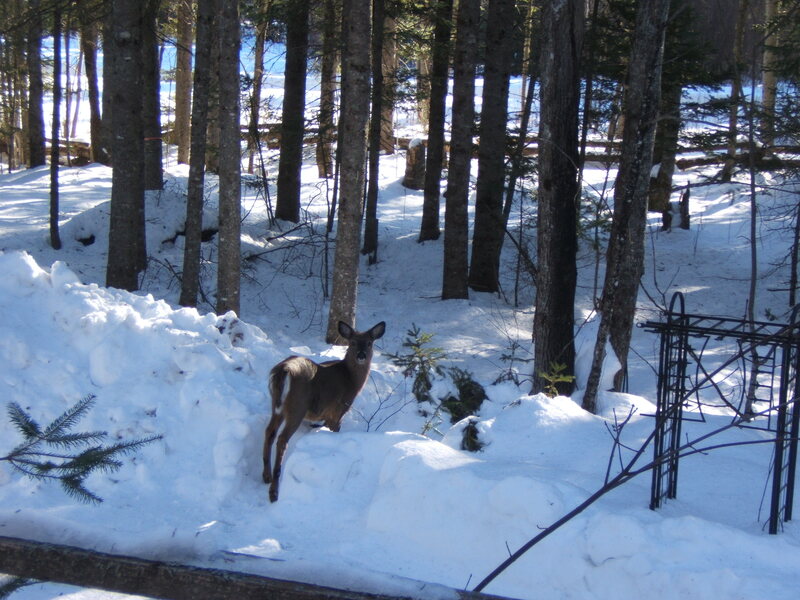 We don’t deliberately feed the deer, but they visit the feeders anyway. Last week, we decided to take a drive along Mountain Road. 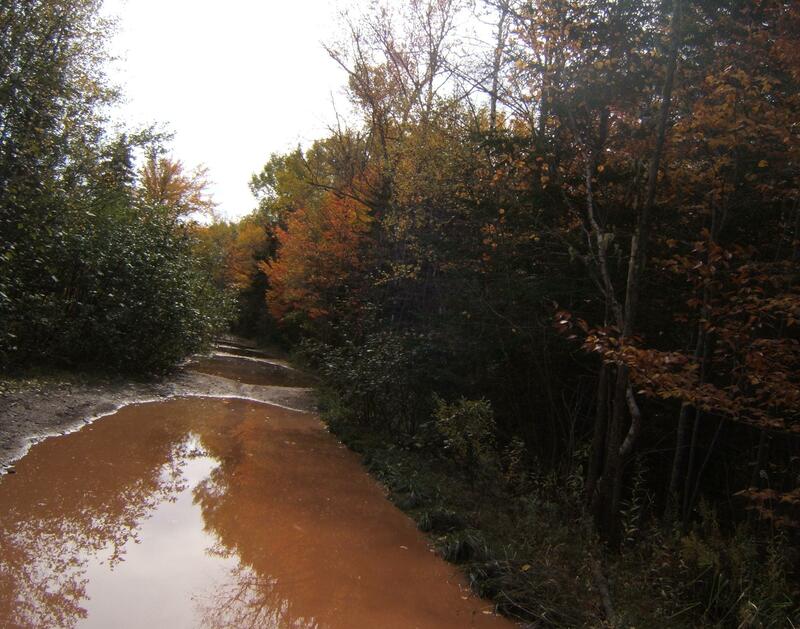 This is a trail extending from Mazerolle Settlement outside Fredericton, New Brunswick to Newmarket, near Harvey Station. We used to take it regularly when my husband and I first knew one another, over 30 years ago. 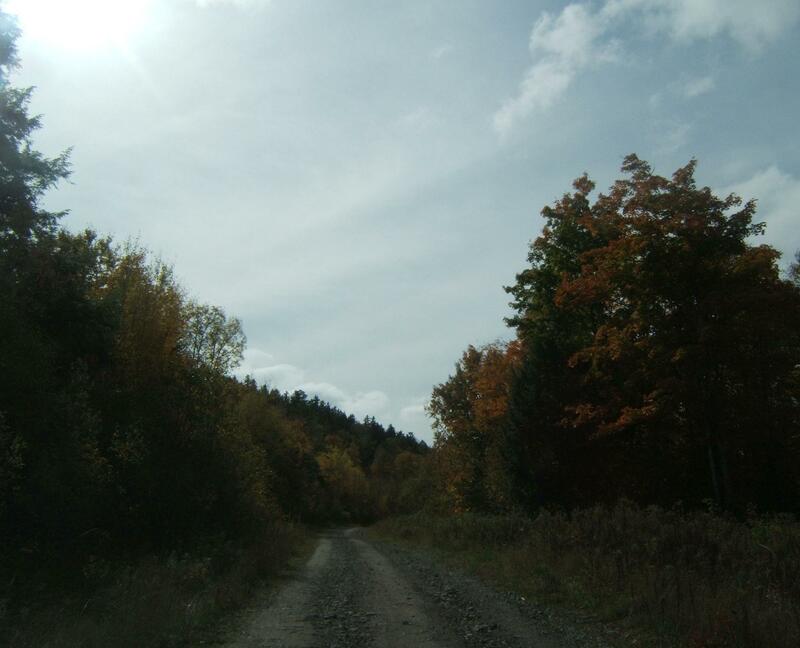 In those days, it was a narrow road built along the side of Porcupine Mountain. It was overhung with hardwoods and crossed the upper part of the Woolastook Game Refuge. We decided it would make a good drive on an October afternoon. 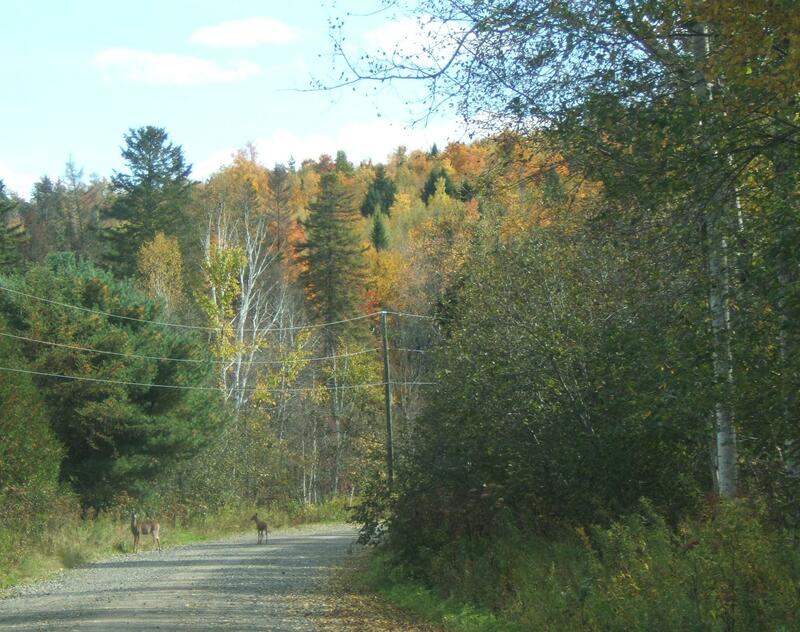 The drive started with a sighting of White-tailed Deer near the road entrance. Then we stopped briefly at an inlet of the St. John River, to watch a Blue Heron take off and circle the cove. 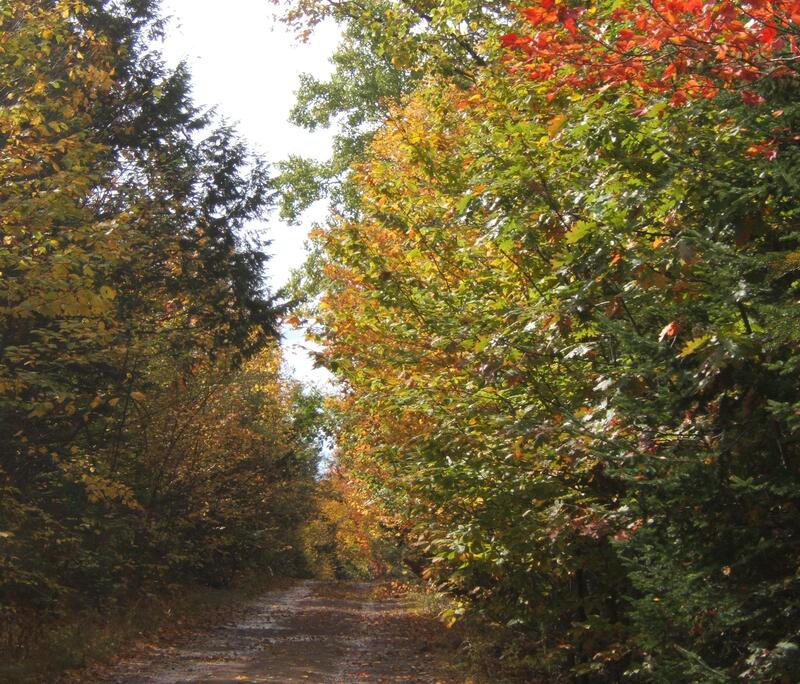 Although there are a few houses along the first part of the road, the area is generally uninhabited and the woods on either side of the road were still natural. 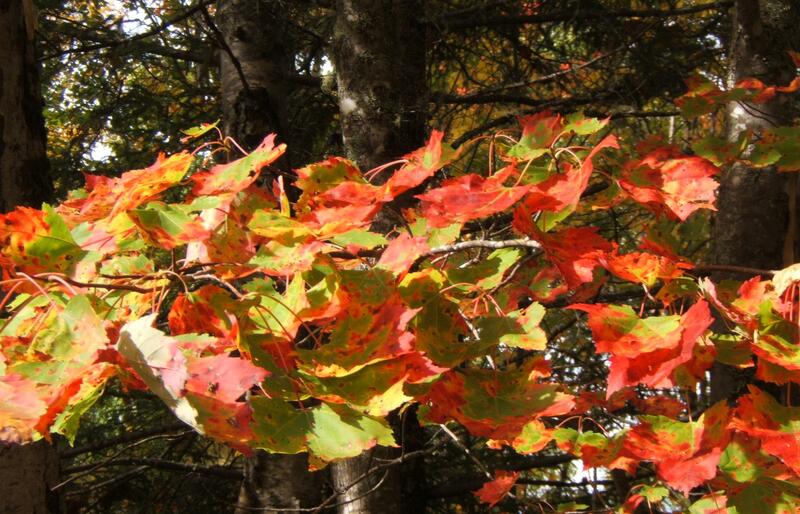 The trees were beautiful – oak, maple and beech were all in various autumn hues. 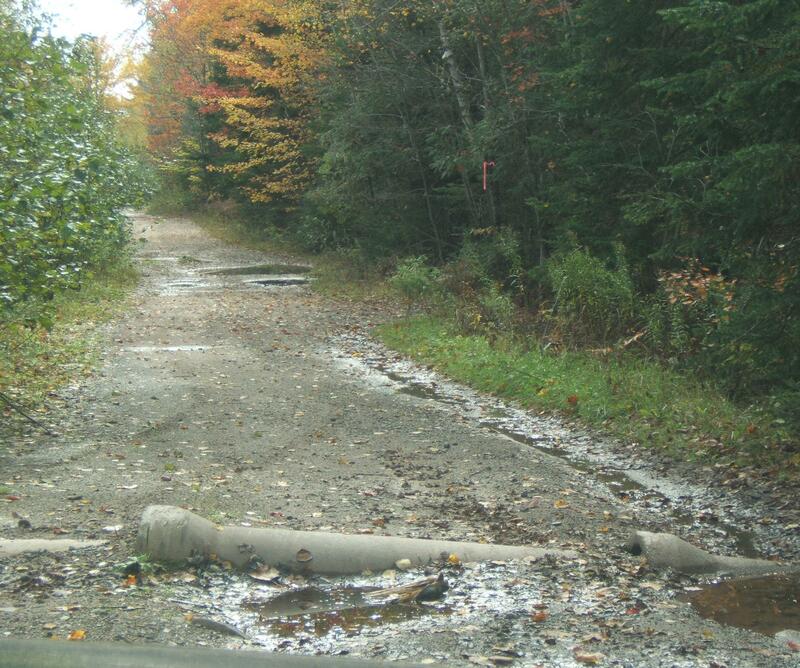 It has rained recently, and as we went further along the road, its deteriorated condition became evident. Culverts were heaved at several points and we had to take our time as the waterholes in the road became deeper and deeper. 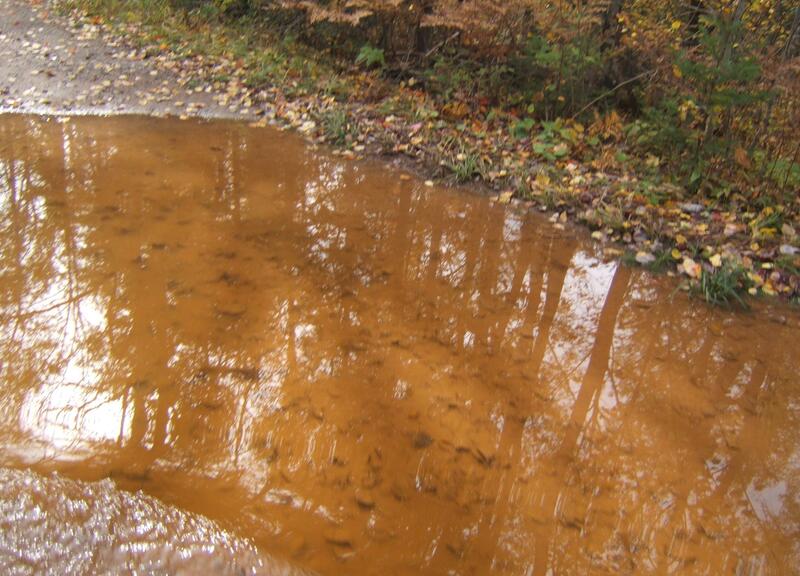 Although the road bed was generally solid, we could feel the tires slipping sideways in a couple of the puddles. 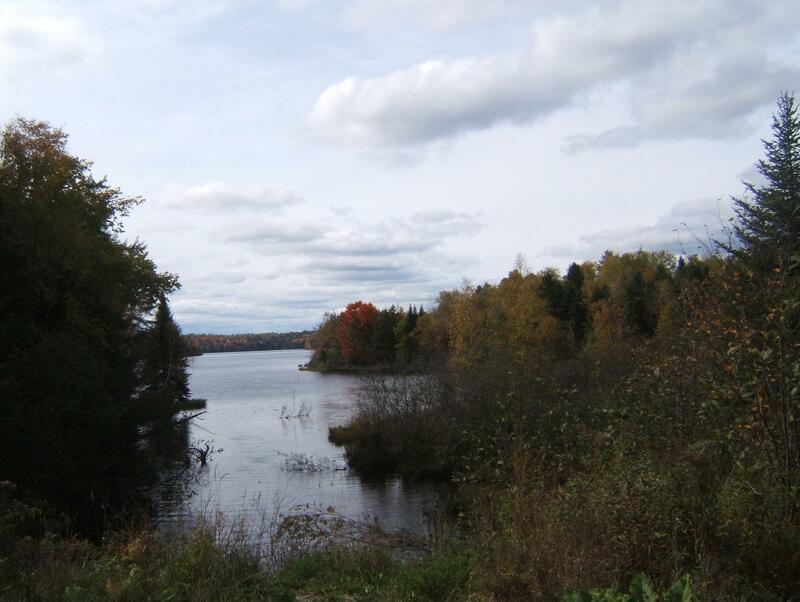 At last, unable to see through the muddy water, and wondering if there were any big rocks lurking there, ready to hang us up, my husband decided to turn back. It was foolish to proceed with summer tires and no winch to help us if we did get stuck. In the old days, we would have pressed on, willing to walk to the nearest main road, but arthritis interferes with foolish bravado! Later, we’ll try the road from the other end. Perhaps we were through the worst, and pavement was just beyond the next big puddle. One of the berry bushes common in our area is Staghorn Sumac (Rhus typhina L.). Its leaves and berries turn brilliant red in autumn, and its berries are displayed in distinctive red ‘horns’. Staghorn Sumac is a small tree or shrub found at forest edges and in wastelands. The shrub has a flat crown and an umbrella-like canopy. It has pinnately compound leaves and toothed leaflets. Staghorn Sumac is a ‘pioneer’ species, often one of the first plants to invade an area after the soil is disturbed. Although it reproduces by seed, it also grows from its vigorous underground root system, and forms dense colonies with the oldest trees at the centre. In this way, it causes dense shade to out-compete other plants. The flowers of Staghorn Sumac are greenish-yellow and occur in spiked panicles from May to July. The berries are velvety, hairy red drupes, and ripen in June to September, often persisting through winter. 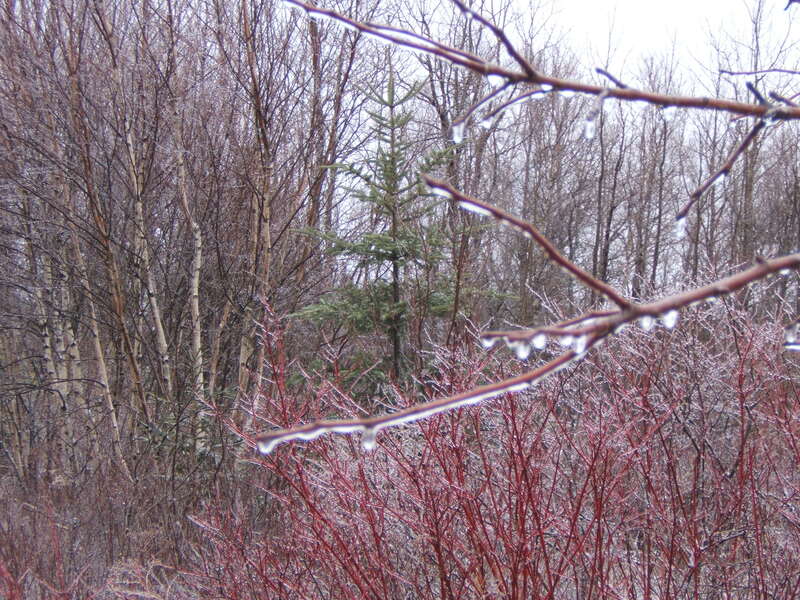 The berries are held in dense clusters or spikes at the ends of tree branches. Staghorn Sumac is also called Velvet Sumac, or Vinegar-tree, and Vinaigrier in Quebec. The common name of Staghorn sumac is derived from the velvet feel of its bark, reminiscent of the texture of deer antlers. 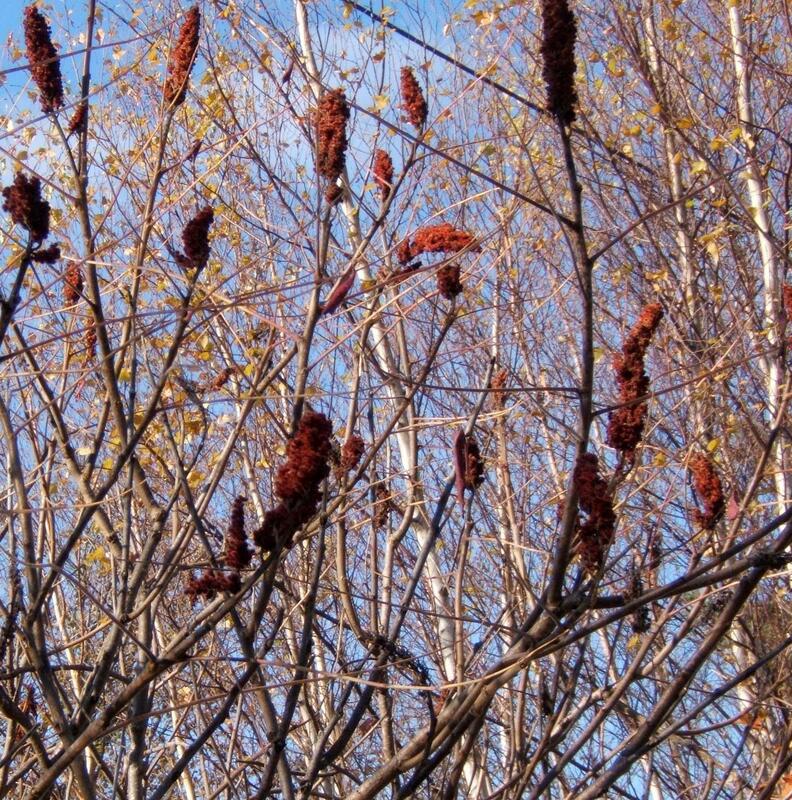 The word sumac comes from the words for red in Latin (sumach) and Arabic (summāq). The specific name ‘typhina’ means ‘like Typha’ (cat-tail), a reference to its velvety branches. The Staghorn Sumac provides food for birds including Evening Grosbeaks and Mourning Doves, and its twigs are eaten by White-tailed Deer. It has many human uses, including for medicine, decoration, tanning and dyes. Staghorn Sumac berries are used to make a lemon-flavored ‘sumac-ade’ or ‘rhus juice’. Remember, before you consume any wild plant, be certain of your identification. 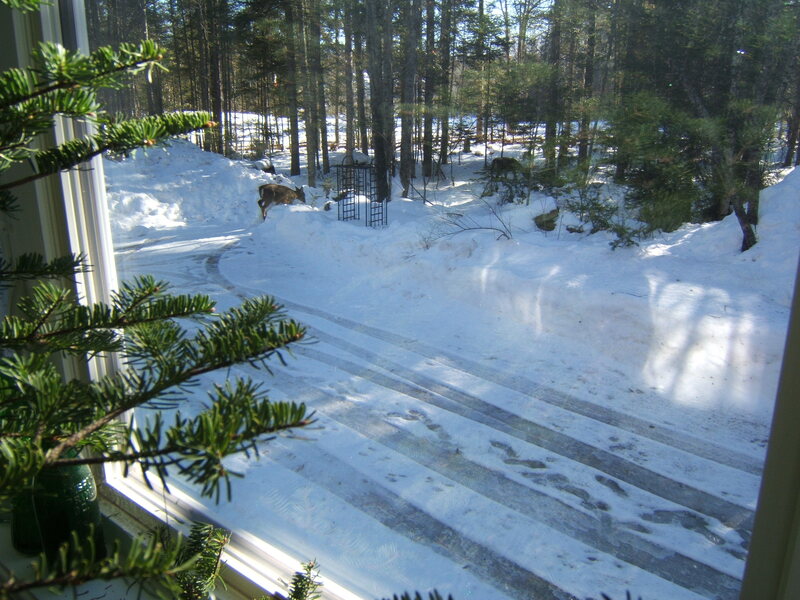 During my trip to Ontario, we spent lots of time, on cold days, enjoying the wood stove. 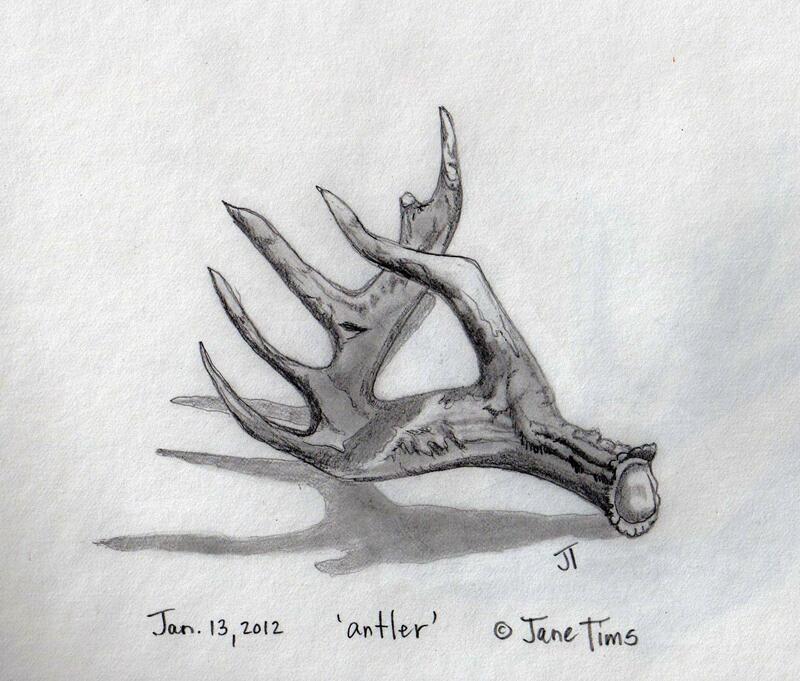 On the hearth was a deer antler, found on a walk in the woods. Usually they are hard to find since the mice chew them to nothing very quickly. 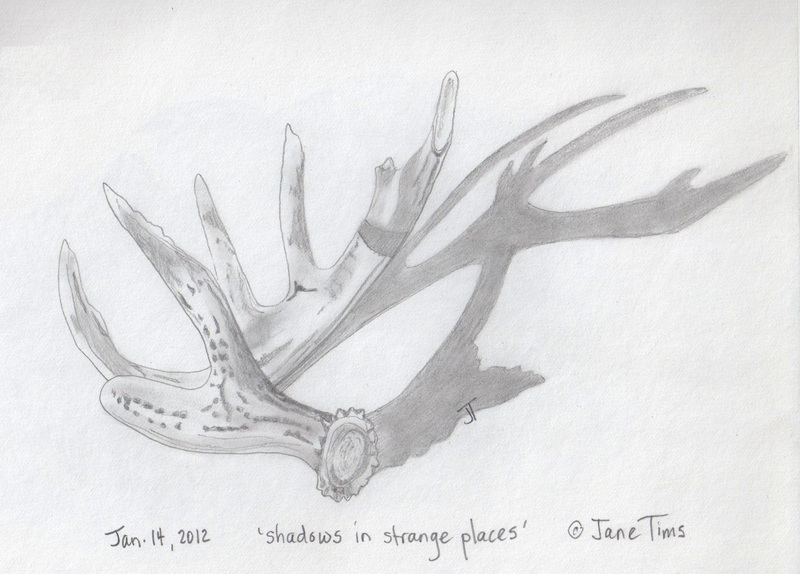 I was drawn to the antler because of its resemblance to a bony hand. I am amazed at the volume of seeds these little visitors eat. The deer, racoons and squirrels take their unfair share, of course. Last year, I watched a deer attack the feeder with its tongue, scooping up every bit of seed in a matter of minutes. Even without the deer and racoons and squirrels, the birds descend in a flock and the food is soon reduced to a scattering of seed-husks. We have come to a conclusion – next year we will put up a mammal-proof feeder. My brother-in-law has it figured out. He has installed a large cedar post in an open area and encased it in aluminum pipe and flashing. Enough seed falls on the ground to give a treat to the squirrels and other marauders, and the birds are the focus of the money-drain.